The guys are starting to groom. We received about 4-6″ on the weekend. Snow depth is about 12-16″ out there. Staging areas are open. Snow levels- 12″+, we are receiving fresh snow now. 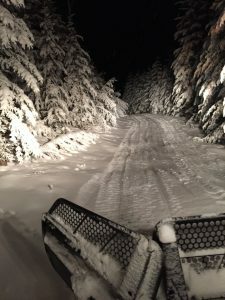 Beware: SnoCats will be out cleaning, filling and fixing trails. 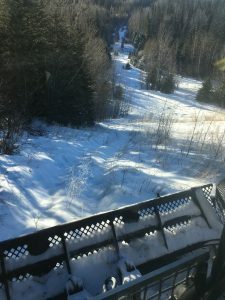 We have not groomed any trails as of yet–we were waiting for snow. There are some bare trails near Rolly Hills road on the Summit Trail. Caution on creek crossings as they can be bare and icy. WARNING: Logging activity present in various areas. The Golden Triangle still requires work around Letter O to Swan Hills and around Freeman, Meekwap areas. Fox Creek reporting low snow levels around Virgina Hills. Both Fox Creek and Swan Hills reporting 2′ of snow. Make sure to get your Snowmobile Raffle Ticket at IGA, Canadian Tire, Adrenaline Powersports, & RPM Powersports. Please purchase your ASA Trail Pass at IGA, Adrenaline Powersports, RPM Powersports, Kanata Esso, First Choice Truck and Car Wash and TTRC. 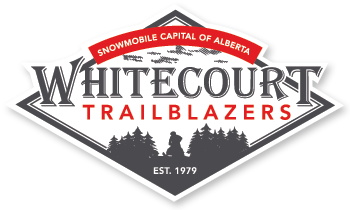 You can also purchase your Trail Pass through our Website or the Alberta Snowmobile Association Website. We hosted our Annual VIP & Media Ride yesterday and had 55 riders who participated on our guided ride out to the Athabasca Lookout. We had a fantastic day – the weather was perfect, the trails were ideal and the fellowship was great. 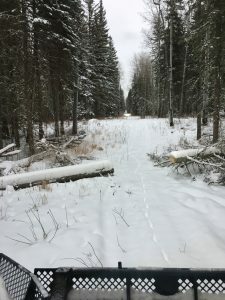 Thank you to our sponsors – Alberta Snowmobile Association, Eagle River Casino, Adrenaline Powersports Ltd, RPM Powersports Ltd., Pembina Pipeline Corp, Whitecourt Woodlands Tourism, McDonald’s-Whitecourt, those of you who lent your sled, gear and to all of our volunteers who made the ride happen. We had 3 Ministers attend: Minister Miranda (Tourism & Culture), Minister Carlier (Agriculture & Forestry), Minister Bilous (Economic Development & Trade), Mayor Chichak, Councillors-Paul Chauvet, Ray Hilts, Derek Schlosser, Tom Pickard, Mayor Rennie, Bruce Prestidge, John Burrows, Ron Govenlock, Alberta Snowmobile Association President Denise England and Executive Director Chris Brookes and our local media from XM105, Boom96.7, Whitecourt Star and Whitecourt Press. In addition, we had Councillor Watson from Fox Creek, RCMP and Fire Department Representatives. Thank you to everyone who came out. We are excited to be hosting our VIP & Media Ride on Monday at the Eagle River Staging Area – 2km n of Eagle River Casino at the Hwy 43 and Hwy 32 Junction at 12:00pm. 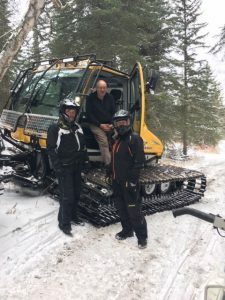 Thank you again to the Alberta Snowmobile Association for our trail lunch, the Eagle River Casino and Travel Plaza for our wine and cheese social and all the club members who are donating gear and snowmobiles for the day. A special thank you to our groomer operators who have prepped the trails for our ride. We will have a wonderful day on the trails and who wouldn’t want to be sledding on a Monday!!!! Staging areas are open. Snow levels- 8-12″. Groomers have cleared off logs off of Goodwin, Summit and Carson Trail to cabins and filled areas with snow. 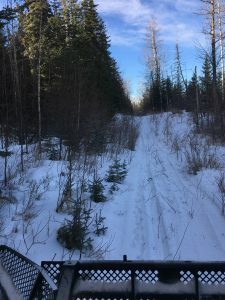 They have not groomed the trails. WARNING: Logging activity present in various areas. 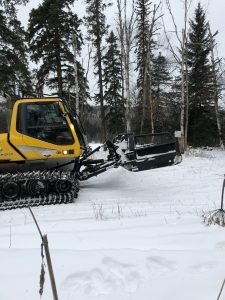 A big thank you to our groomer operators Don and Dave for getting the trails prepped. 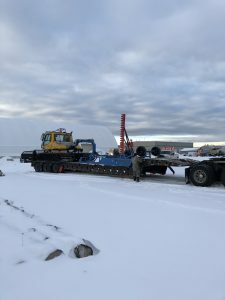 Thank you SLH Picker Service for transporting the groomer and drag this past weekend. 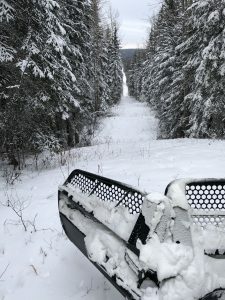 Beware, we have groomers working (filling in areas with snow) and removing trees along trail on the south side and north side (Carson Lake area). 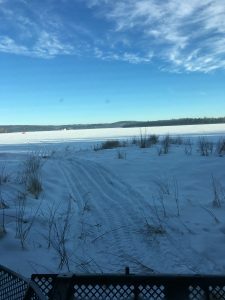 Trails have not been groomed.